I’m not sure where I first saw it, but years ago, I clipped a recipe for the most beautiful potato “chips”. The idea was to thinly slice red new potatoes, toss with oil, then bake in a single layer with one solitary sage leaf under each one. The result was a bowl full of crispy, red-rimmed sage cameos, each unique, and each incredibly delicious. My father (never really one for a strong herb flavor) thought the sage a bit overpowering; but I disagreed. In my opinion, each bite of potato carried with it just enough of the heady scent of sage, just enough to balance the woodsy, sultry perfume with the earthy starch of potato. That recipe remains in my permanent recipe file to this day, and I often remember it fondly, as the taste haunts my tongue. But unfortunately, as sublime as they were, the recipe never seems perfectly appropriate to pull out when company comes over. It’s either a bit too fussy, or the sage would compete with the main attraction on the plate, or would be too much starch for the menu. They’re so stunning, you almost want to set them out alone as an hors d’oeuvre, but that doesn’t feel exactly right, either. I mean, baked sliced potato? Maybe if you served it with some fabulous spread; but then you rather destroy the appearance, and you’re essentially left serving herbed potato chips. I don’t know, maybe that’s okay, but it’s not quite my style. Plus, they don’t stay crisp terribly long; you’re almost forced to make them at the last minute, which is when I’m usually worrying about the entrée (and a hundred other small things). But then, I hit on the idea of keeping the presentation, but ditching the ingredient: use a cracker dough instead of potato! Who doesn’t like crackers? You don’t need to worry about clashing flavors, covering up the pretty leaf pattern, or making things at the last second. These will stay crisp and beautiful for days. Problem solved! Finding a proper cracker recipe to adapt was the next step. I needed a specific sort of dough, one that could be either rolled out and cut, or could produce slices from a chilled log of dough. And I didn’t want anything too bready; I wanted crisp and flaky here. Oh, and there shouldn’t be any overwhelming flavors to compete with the sage, but they should be a bit more interesting than water crackers. Armed with my demands, my search finally ended on the King Arthur Flour website, with a recipe that promised an easy-rolling dough that would produce crispy crackers that were a bit dense, not nearly as airy as a traditional soda cracker. The dough was rich with butter and cream, but had no unusual flavorings. Perfect! So I omitted some sugar, added some milk, mixed, rolled, and decorated with the prettiest sage leaves I could find. The dough worked beautifully, producing buttery crackers that were not too flaky, but not at all dense and heavy. Each sage leaf sat in perfect contrast on its little cracker pillow, coolly suggestive of the seductive flavors in store. And oh! the smell as they baked! The sage wafted out in fragrant waves, filling the house slowly with its singular scent. You want to attract attention? Bake these, and see who comes nosing around your oven! One trick to this recipe is to start baking these crackers with the leaf-side down, then flip them over to finish browning. This helps each leaf adhere to the cracker base. (Two days later, they hadn’t fallen off yet, and this after being jumbled together in a plastic bag!) Additionally, this means you dock the underside of the crackers (which releases steam while baking, and keeps your crackers from puffing up), preserving the pretty leaf design on top. The end result, as you can see above, was everything I was aiming for. I got to keep my perfect little sage leaf vignettes, each bite carrying just enough sage flavor to complement the cracker underneath; but gained a company-worthy version of those long-ago potatoes. You absolutely don’t need anything to serve with them (though a nice wedge of cheese is never a bad idea), since the flavors are bold enough to stand alone. And if there’s someone in your group who doesn’t like sage (I’m looking at you, Dad), well, that just means there’s more for everyone else. 1. In a bowl, whisk together the flour, salt, baking powder, and sugar. With a pastry blender or fingertips, cut in the butter until the mixture resembles coarse meal. Some pea-sized lumps are okay. 2. In a separate bowl, use a fork to blend the egg, cream, and milk together until smooth. Add the egg mixture to the flour mixture. Using a rubber spatula or a fork, gently stir until a soft dough forms. If crumbly, drizzle additional milk or cream over, by tablespoons, until the proper consistency is achieved. The dough should not be wet, but should still hold together when pressed. 3. Form the dough into an flat round, about 1 inch thick. Wrap well with plastic wrap, and chill for 1 hour. While the dough chills, pick about 50 of the flattest and nicest-looking sage leaves, and set aside. Preheat the oven to 425° F.
4. Lightly oil a large baking sheet, or line with parchment paper. On a floured surface, roll the dough out relatively thinly, between 1/16 and 1/8 inch thick. Periodically lift and rotate dough to ensure that it is not sticking, dusting with additional flour if necessary. 5. If making square crackers, cut dough into 1 inch strips with a round (pizza) cutter, or a bench scraper. 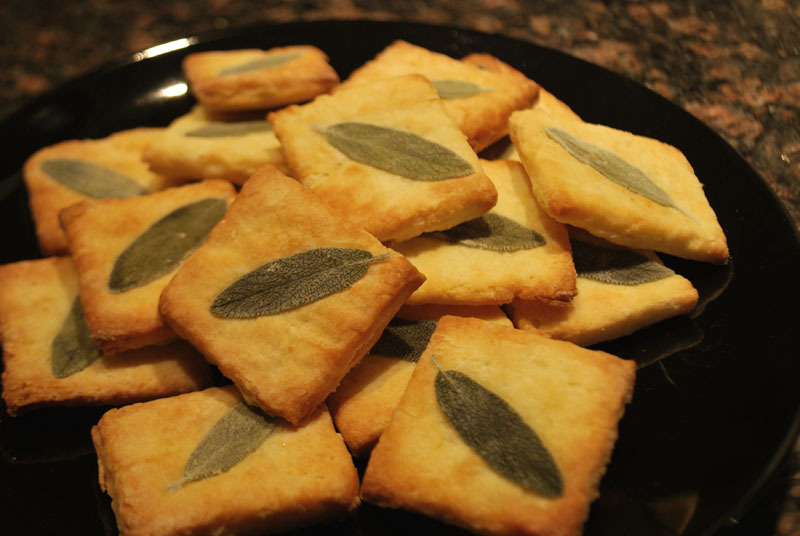 Arrange sage leaves diagonally on the strips, pressing each one gently into the dough, then cut each cracker to size. If making round crackers, cut the dough into rounds using a 2 to 2 1/2 inch round cutter. Press 1 or 2 sage leaves gently into the dough. 6. Transfer each cracker to the prepared baking sheet, leaf-side down. Dock each cracker several times with a fork. If the butter seems soft in the dough, or if you can see that it has melted a little while cutting, cover the baking sheet loosely with plastic wrap, and refrigerate for 10 to 15 minutes to firm up the dough. Gather scraps, re-roll, and cut into desired shapes. Refrigerate if necessary. 7. Bake crackers leaf-side down at 425° F oven for 6 minutes. Remove the pan from the oven, and turn the crackers over. Sprinkle with salt if desired, and bake for an additional 5 minutes, or until crackers are lightly browned. Remove crackers to a rack to cool completely. 1. In step 7, it may help the salt to adhere to the crackers if they are brushed with a little olive oil or melted butter first; or, the extra salt may be omitted totally.